A City Escape In A Central North Fork Location By Wineries, Beaches, Farms. 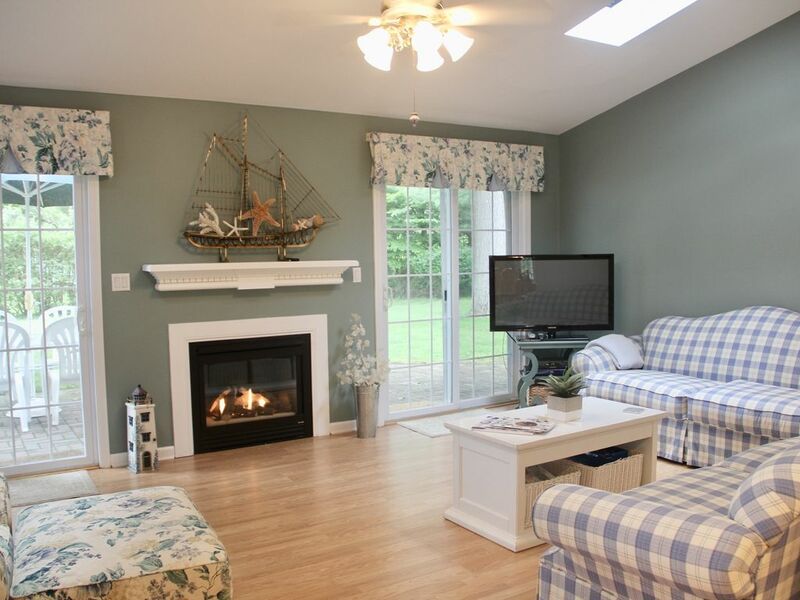 3BR, 2 BTH, short walk to Long Island Sound in Mattituck, neat & tidy with a nice backyard. The sun shines brightly into this quaint little gem of a house on the North Fork. Has a fully equipped kitchen with spices, all cooking utensils, a traditional and Keurig coffee machine, bring your favorite K-cups. There is a blender and a mixer for drinks and baking. The living room has a large flat screen TV with cable and the house has WiFi. Backyard has a propane gas grill and there is a portable fire pit for roasting marshmallows in the evenings. There is an open shower with both hot and cold water for showering off sand after a day at the beach. Large enough back yard to place a volleyball net up. Separate 1 car garage to store beach items with a second refrigerator if necessary. The two bedrooms have queen sized beds with a double twin bunk perfect for families. The master bedroom has a vaulted ceiling with its own full bath and separate entry to the backyard patio. There are ceiling fans in all rooms. The mattresses have fresh casings and all sheets/towels are cotton. Bathrooms contain hair dryers. Located a couple miles from Love Lane with cute shops such as a book store, tasting room, fantastic Cheese shop, chocolate shop, the popular Love Lane Kitchen and boutiques. Also in town is Starbucks, popular Magic Fountain ice cream, and a multiplex cinema for rainy days. Tons of things to do on the North Fork- Vineyards (with tours, live music and tasting rooms), beaches (both bay and sound), farm stands (with roasted corn, mazes, pumpkin/apple/berry picking), jet skiing/kite surfing/paddleboarding (Peconic Bay Water Sports), horseback riding, hiking/biking trails, antiques, Greenport harbor (brass ring carousel, sunset cruises, trendy shops, restaurants), Shelter Island, farm-to-table restaurants, museums, lighthouses, boating, Splish Splash water park (voted top 10 in the country), Tanger Outlet Mall (with over 200 stores) , goat farms (feed milk bottles to the goats), Atlantis Marine World Aquarium (shark tank, stingray feeding, sea lion shows). Live music with outdoor dining and a pool with weekly passes at Strong's Marina. Have paddle boards delivered to and picked up right from the beach at East End Sporting Goods. Property has been in the family since the mid 1900s when it was built. Expanded and updated 10 years ago. My wife's parents were the original owners and our children spent summers here growing up. RIght in the middle of the north fork which makes it just a short ride to either end. Blow dryers in each bathroom. 1 window unit in master bedroom. Ceiling fans in all rooms. Outdoor small metal firepit for roasting marshmallows and gathering. Blender for smoothies and margaritas. Blender, lobster pot, plenty of pots and pans, mixer, baking utensils. Fully loaded with cooking utensils. 6 seat dining table and 5 barstools at the adjacent kitchen counter. Some in garage. Beach toys and umbrella. One small bike. Boogie boards, a float, beach umbrella and sand toys in the garage. Passes required and obtainable to park at both Mattituck and Southold beaches. Lovely, well maintained home. Very comfortable. Near great beaches and quaint towns, restful, quiet! Diane and her family are most attentive to concerns and respond quickly! The cottage is comfortable, with well stocked kitchen, clean newer linens and wonderful,responsive owners! It is only a short walk to scenic beaches, which we enjoyed with family. Loved the farm, fresh produce, and nearby visits to close by quaint towns! We enjoyed the new central air for the few hot days! Would recommend this cottage for sure! Well appointed, everything you need is there. Very comfortable, peaceful and quiet. Diane is a wonderful host and makes sure everything runs smoothly for you. Very comfortable home walking distance to a sound beach, with plenty of sleeping space and a well equipped kitchen. Diane is a very helpful and responsive host. My family and I rented the Inlet Drive cottage for about 12 weeks this past summer and loved it. From the walking proximity to the bay beach, to the nearby Harbes Farm and other vineyards -- we had a really fantastic summer. The cottage had everything we needed -- and it was super roomy with two rooms kitted out with bunkbeds for our kids and for their friends to visit. The owner and his daughter were incredibly helpful and lovely -- alway willing to answer questions and in one instance, quickly deliver a new gas grill when the old one seemed to be past its prime. My husband stayed at this beautiful cottage in July 2015. We felt a warm feeling and the amenities are amazing, and beautifully decorated. There is a beautiful large backyard with trees for shade. It is only located 2 blocks from the beach. Many nice restaurants and minutes away from the famous Love Lane of Mattituck & Greenport. Lighthouse tours. Harbes Family Farm- when in season- berry picking, corn mazes, roasted corn, pumping picking. Tanger Outlet Mall. Greenport Harbor with shopping, sunset cruises, carousel where children capture the "brass ring," paddle boarding. Orient Point National Park. Atlantis Aquarium with wonderful sea lion show, shark tank and sting ray touch tank. Goodale Goat Farm where you can feed goats bottles of milk. Wineries, farm stands, antiquing, beaches. All within 20 minute drive. Any movie rentals via cable will be subtracted from your deposit. Discount offered if you stay multiple months.